Or maybe someone else turned the light switch off after I asked 700 million times for someone to do it. And now you've been robbed of that experience and will never ever ever in your entire life ever have the chance to turn off a light switch again. The horror. You will grow up stunted, sheltered, unable to conserve energy and forever doomed to be ridiculed by a peer group of responsible citizens whose approval you are desperately seeking. I understand there will be therapy bills. What an unfortunate circumstance you now find yourself in. I am beginning to conceive of the anguish that has led you to re-creating a Broadway-caliber audition for a banshee from your hiding place behind the couch. What are you saying? I can't hear you over the sound of the lions fighting a bear on a motorcycle to save their unborn cub... otherwise known as the sound of your displeasure at finding yourself wearing your very favorite socks on a Tuesday. I don't really understand it, but I'm sure there is some kind of cosmic shift that will forever alter the way we live our lives and maybe someday humans will have 3 arms and no longer be able to see the color purple all because I helped you put on the socks you chose. I get the whole parenting notion of not giving in to the tantrums. I GET IT. In my brain...I say the words and I believe them. And I try ever so hard to wait it out and be patient and say things like, "Well, if you change your mind, your popcorn will be right here" and ignore the whole scene when all I really want to say is, "FOR THE LOVE MAKE IT END RIGHT NOW." But let's be honest - there is NO ignoring that scene. It's like having a jack-hammer on your brain and you saying, "Oh...I didn't notice you there." You NOTICED them there. You can't HELP but notice them there. You also can't do anything else because you are using all your energy to keep your brain from falling to pieces. In case you are wondering... I gave my kids cereal for dinner and every time they fought with each other, I set a 3-minute "silence" timer. Thank goodness I have some cookies to look forward to tonight. Want to make some cookies with me tonight and pretend like you get a piece of chocolate every time you hear someone whining? 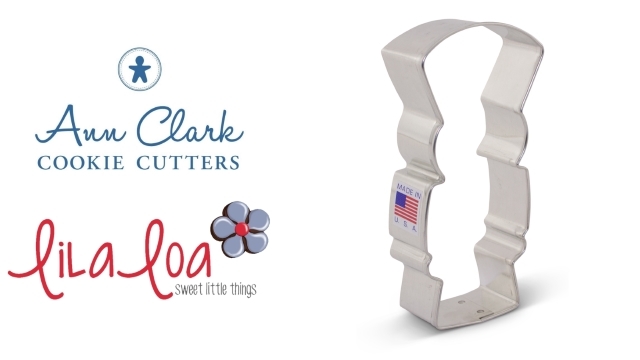 Grab my new Nutcracker Cutter from Ann Clark Cookie Cutters and get started baking! 1. With medium consistency white icing, outline and fill a rectangle section of the cookie for the torso. Outline and fill the hat with a gold icing. Let dry for an hour. 2. Fill in the face area with a skin color icing. Outline and fill the pants are of the cookie as well. Let dry for 15 minutes. 3. Use purple icing to pipe a belt and hat band. Put a #1.5 tip on the gold icing and pipe epaulettes on the shoulders and shoes. Pipe some feathers on the hat with the blue icing and a #1.5 tip. I wasn't too worried about those feathers looking like actual feathers. Any random mess of piping up there is going to look just fine. Pipe two dots of skin color icing at the end of each arm to make hands. Let it all dry for another 15 minutes. 4. Pipe a tiny little square under the feathers on the hat with a light purple icing and a #1.5 tip. Add hair with a medium consistency brown icing. Pipe vertical white detail lines on the shirt. Add a line down the center of the pants. 5. When the icing for the face is completely dry, draw a face with a black food color marker. Add uniform details across the chest with the light purple icing. 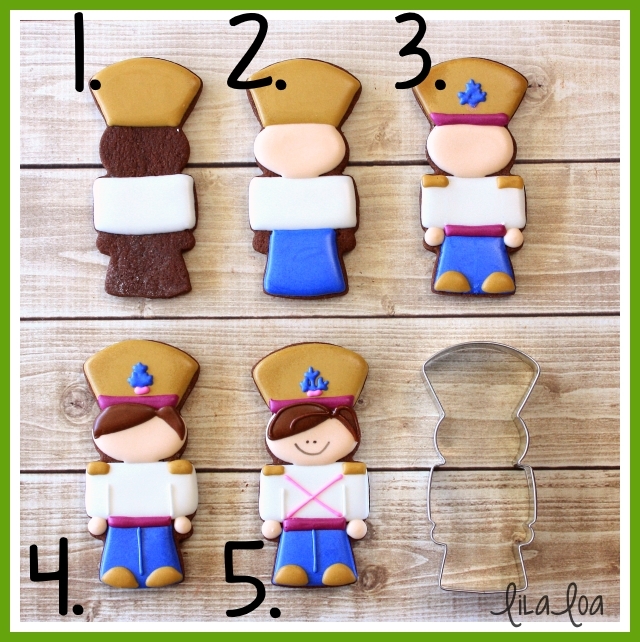 Add hair detail lines with the brown icing and a #1.5 tip. Let's talk about the GOLD ICING: I used Americolor gold mixed with just a little bit of green to make the icing. I feel like most gold food coloring is more yellow than gold...and adding a little bit of green gets it closer to a real shade of gold. When the icing was dry, I painted the surface with TMP Super Gold dust. 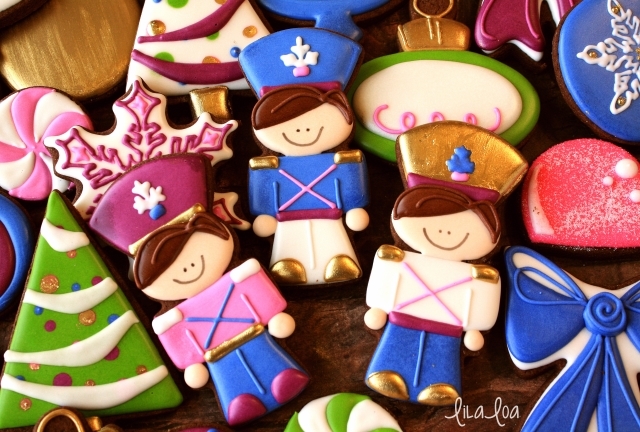 Grab the cutters: Tin Soldier, Tree, Snowflake, Finial Ornament, and Bow. I use THIS FOOD COLOR MARKER. See how I used the same cutter to make a TRADITIONAL NUTCRACKER COOKIE as well! Grab the matching SUGAR PLUM FAIRY CUTTER and then find the SUGAR PLUM FAIRY TUTORIAL HERE.